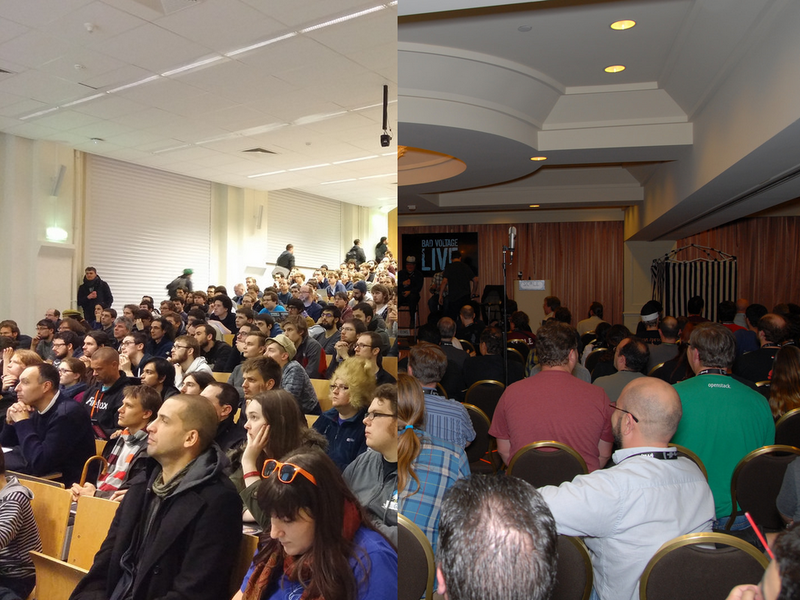 We blogged back in January about the 2015 conference season being kicked off by FOSDEM and SCALE this February. 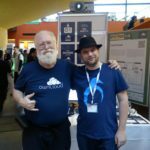 Both have come and gone, but and we wanted to share some of the enthusiasm we encountered around ownCloud at these events! Let’s start by introducing the two conferences we attended. 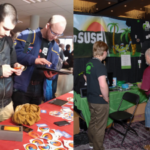 FOSDEM (usually the first weekend in February) and SCALE (held around the 3rd weekend of the month) are the two biggest Open Source enthusiast events in Europe and the USA respectively, attracting anywhere between four and six thousand visitors to each event. The two events are very different, however. Where FOSDEM takes place at the ULB Solbosch university and has no registration whatsoever, SCALE takes place at the Hilton Los Angeles Airport and charges an entry fee. Also, while FOSDEM honors its title as the “Developer (European) Meeting” and features independently organized dev rooms, just a few centrally organized talk tracks, and booths spread out all over, the ‘Linux Expo’ usually has about a dozen tracks–organized by the paper committee–and two large exhibition rooms with booths. Both events are growing more popular each year and are offering exciting programs for a varied, yet loyal audience. 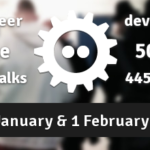 Both FOSDEM and SCALE video record all of the talks, so they can be streamed later. SCALE streams the videos directly on their website, while FOSDEM has a video archive that dates back several years. Even though the videos provide a certain view on the talks, the atmosphere of the rest of the venue can be best experienced from a photo collection site such as flickr. Click the following links to view the pictures from FOSDEM and SCALE. In this post you can also see a small selection of photos as well as a time-lapse video of our Saturday morning at the ownCloud booth at SCALE featured below. 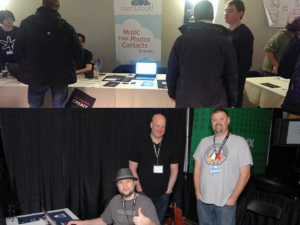 At both of these events a team of ownClouders ran a booth as well as presented one or more talks about subjects around ownCloud– privacy, security, cloud, federated sharing and owning your data—just to name a few. In total, several thousand fliers, stickers, pins and other cool giveaways were handed out by our booth crew during or after a conversation with the visitor. The audiences at both of these events have been incredibly positive and inspiring! While there were some users who had questions, there were many people who had never heard of ownCloud and were interested in the basics of what ownCloud is and does. There were also others who just wanted to stop by to let us know how happy they were with ownCloud. Those who hadn’tknown about ownCloud already were pleasantly surprised, noting how glad they were to hear about it. Questions were seldom difficult to answer: people wondered how long ownCloud had been around (we just turned five), if it was open source (yes, with love), how many people contributed to it (719 and counting) and how many users it has (we estimate over 2 million, with 500,000 in this single deployment alone). Oh, and does it scale? The deployment linked above and the mention of users like CERN put most concerns to rest. Yes, ownCloud scales from Raspberry Pi to Atom Smashing size, yes, we’re awesome, and yes, it is amazing that not everybody knows about it yet! 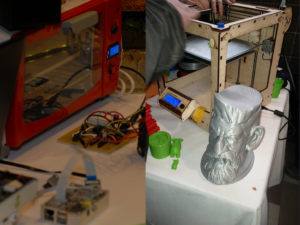 You can read more on ownCloud’s presence at these events here for FOSDEM and here for SCALE. At both events the booth was swamped with visitors and while the enthusiastic booth teams did a great job keeping up, we would very much welcome more help next year. If you’re planning to go to either of these events, or any other open source conferences, join our events mailing list to be kept up to date or checkout our events page to see where we are attending and of course, in general, keep on helping to promote ownCloud! 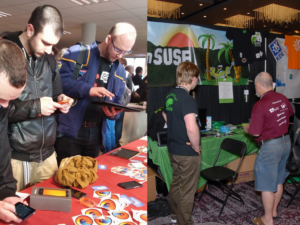 A special shout-out goes to ownCloud fans who plan on going to SouthEast Linux Fest and Texas Linux Fest in the US.We’d love to have a booth, but we’re going to need a little help with that. As for our European users – you can expect us soon at the Chemnitzer Linux Tage. And there too, help is more than welcome!